Karthik Srinivasan, a Digital Marketer from Bangalore was going through his email when he discovered that HDFC Bank had been charging him Rs 100 per quarter for a program he never signed up for. On delving deeper, he discovered that the service was an opt-out program that had been activate for his account without his express consent. Worse still, the opting out requires a member to actually read their spam-like banking emails, from top to bottom, discover the fine print that states that the offer is an opt-out one and then click on a link to opt-out of the service. But what’s Rs 400, right? That still doesn’t equate to hundreds of crores of rupees. Rashmi R. Padhy took to Medium to break down why the money is real and why this is indeed a scam. Pointing to VAS (Value-Added-Service) fraud that was prevalent some years ago, Padhy notes that telcos used to offer VAS as “free” trials. After the trial was over, these telcos would charge you for the service and keep doing so until you opted out. The value of the transactions was small, but scaled up, the telcos likely earned in hundreds, if not thousands of crores. The rising number of complaints caught the Telecom Regulatory Authority of India’s (Trai) attention and the practice was halted. HDFC Bank appears to be doing the same thing. The bank essentially upgrades you to a free Classic / Preferred Banking trial program without your consent and then charges you Rs 100 — plus service tax — per quarter till you opt out. Since most people would not read the mailer that explains all this and since the price isn’t placed up front, most people will not opt-out because they simply don’t know. Padhy breaks down the calculations as follows. 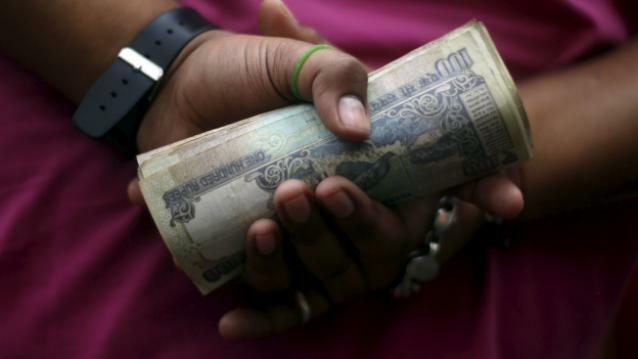 Charging 1.2 Cr customers a fee of Rs 400 a year, HDFC is set to earn upwards of Rs 400 Cr a year. For free, without the explicit consent of its members. The calculation may not be as cut and dried as Padhy puts it and the numbers might be much lower. This doesn’t, however, change the fact that the program is inherently fraudulent. And other banks might soon follow suit, if they haven’t already. As heinous as the practice might seem, it is currently perfectly legal for it to do what it’s doing. Day 49: Invite-only, they said. You’ll be charged, they said. ‘Here’s opt-out link’, they hid in email. Most people may not even be aware of the service or the charge. A charge of Rs 400 a year can easily get lost in the tens of thousands of transactions that we perform every year. And how many of us actually peruse through our monthly bank statements in that much detail anyway? Many more of us probably delete bank mails the moment they arrive in the first place. Srinivasan did not take this charge laying down. On discovering the charge, an average person might simply have opted out, vented a bit on social media and left it at that. Srinivasan is, however made of more Gandhian stuff. 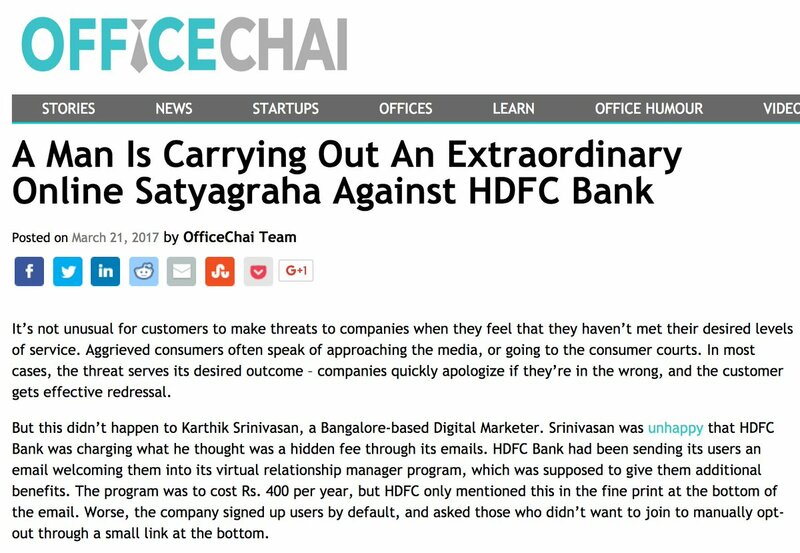 As Office Chai puts it, Srinivasan is now on an online ‘satyagraha’ to get HDFC Bank to apologise for trying to scam its customers in such a way. Overturning an order of the Maharashtra State Consumer Disputes Redressal Commission, the National Consumer Disputes Redressal Commission (NCDRC) last week termed the refusal of HDFC Bank to hand over cash to a bearer of a cheque, after verifying his credentials through the account holder, as “a clear case of deficiency in service”. The order relates to a consumer complaint filed by Mumbai resident Prakash Sheth against HDFC Bank. Sheth required Rs3 lakh to be deposited in the hospital for treatment of his ailing mother, in 2010. He requested his nephew, Chirag, for the money. Chirag gave a bearer cheque to Sheth, who then presented the bearer cheque on 7 May 2010 at HDFC Bank. The cashier in the bank asked him to come back at 4pm because of insufficiency of funds. When he returned at 4pm, the cashier asked for his photo ID, which Sheth was not carrying. The cashier then called up Chirag to seek verification of issuance of the bearer cheque. Chirag confirmed it, but the cashier refused to honour the cheque and Sheth was asked to meet the branch manager. The branch manager too checked with Chirag to confirm that he indeed had issued the cheque. Despite that, the manger insisted that Chirag should personally come to the bank, which the latter was unable to. The branch manager then refused to honour the cheque. Claiming this to be deficiency in customer service, Sheth filed a complaint in the Consumer Forum at South Mumbai District, seeking compensation to the tune of Rs1 lakh towards mental agony and physical harassment. Sheth also appealed for a directive to the bank to stop this practice. The bank was served a notice, but it claimed that it had rightly not honoured the cheque as per guidelines from the Reserve Bank of India (RBI). The District Forum therefore dismissed the complaint. Subsequently, the Maharashtra State Commission too dismissed Sheth’s petition, stating that the bank had rightfully adhered to RBI guidelines. As per RBI guidelines, banks have been advised that “in case of transactions carried out by a non-account based customer, that is a walk-in customer, where the amount of transaction is equal to or exceeds Rs50,000, whether conducted as a single transaction or several transactions that appear to be connected, the customer’s identity and address should be verified”. However, Sheth’s contention was that two officials of HDFC Bank had personally cross-checked with the account holder, which proved that it was a clear case of harassment. In this case, while the State Commission dismissed Sheth’s petition, it upheld that although Sheth was not an account holder of HDFC Bank, he still was a consumer. The Commission observed “…the consumer is not only the person who hires or avails the services of the service provider but the beneficiary also. It is argued that once the account holder had issued a cheque in favour of someone, he automatically becomes the beneficiary and therefore he is a consumer”. The National Commission declared HDFC Bank’s stance in not honouring Sheth’s cheque as ‘deficiency of service’ and asked it to pay compensation of Rs10,000 to him for harassment and humiliation.